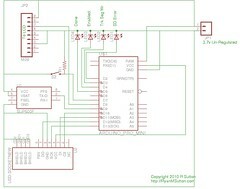 Published on December 7, 2010,	by RyanMSutton in Arduino, Hardware. So my next step in my GPS logger project will be to pull the components off the breadboard and build a small prototype to gather some more real world data without needing to be so careful with it. So I figured I would take some time to describe the general layout of the current board.